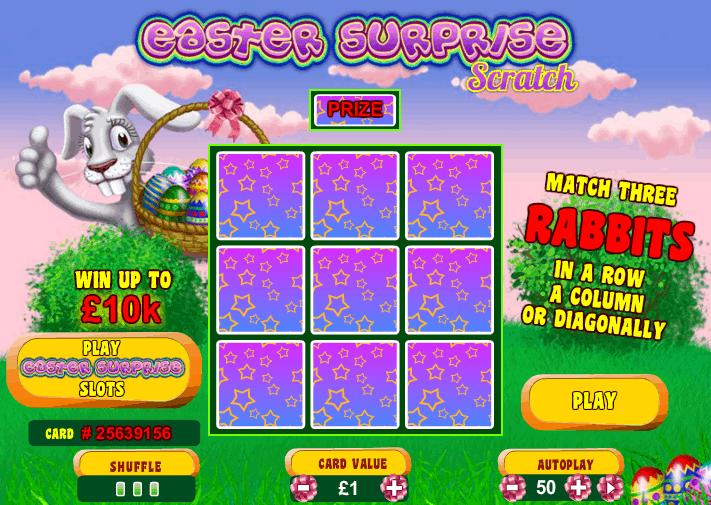 Easter Surprise is a 5 reel and 20 payline slot game produced by the software developers at Playtech. The game has an Easter theme and is filled with pastel-colored Easter-related imagery such as Easter Bunnies, Easter Eggs and Easter Baskets. The graphics are relatively simple but are cheerful and brightly colored. The background of the game is set against a fluffy green hill and pink, candyfloss clouds. Easter surprise has a childlike feel that is reminiscent of the excitement felt on Easter morning as a young child. The Scatter in Easter Surprise is the Gift. To unlock the Free Spins Round you will need to land 3 or more of these Gift Scatter symbols anywhere on the reels. Players will be rewarded with 10 free spins, no matter how many Gifts they land and these free spins will come with a 3x multiplier. The free spins round can be re-activated within the round by landing another 3 Gift symbols. The Easter Eggs Bonus round will be activated when players land between 3 and 5 Easter Basket Bonus Symbols anywhere on the reels. Players will now be taken to a separate screen where they will be presented with an Easter bunny holding a basket of 6 Easter eggs. Players will get to pick the same number of eggs as the number of Easter Basket symbols. Each egg has a different cash prize attached and all the cash prizes will be added up at the end to give players their winnings from the round. The Easter Egg symbols in the game are the higher payer symbols and pay out quite decently. 5 of a kind will award players with between 200x and 500x your bet. The Wild Symbol in this game is the Easter Bunny. This symbol has the power to replace all symbols in Easter Surprise, thus creating more winning combinations with almost every spin. The only symbols that the Wild can't replace are the Scatter and the Bonus symbols. There is also a Gamble feature in Easter Surprise that gives players the chance to double their money in a card game. You will need to click the 'Gamble' button at the end of a win and you will be taken to a game where you will have to pick between a red card and a black card, if the next card dealt is the color you picked you will have doubled your winnings. The Wild is the symbol is the Easter Bunny and can replace all the other symbols except for the Scatter and Bonus. The Scatter symbol is the green and purple Gift Box and can unlock free spins and multipliers. 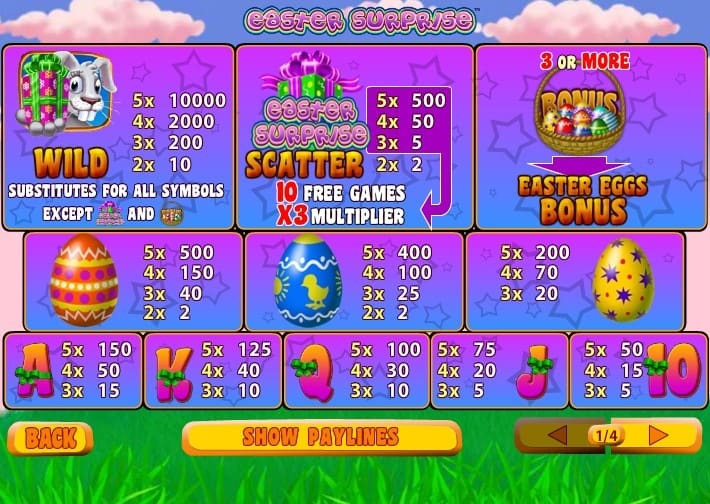 Easter Surprise is a bright and cheerful slot game themed after one of our favorite holidays. While it may seem simple at first glance but it is filled with exciting bonus features. The bonus features in this game are quite diverse which make for interesting game-play. The payouts are also surprisingly high and matched with the RTP of 97% there is unlimited winning potential.